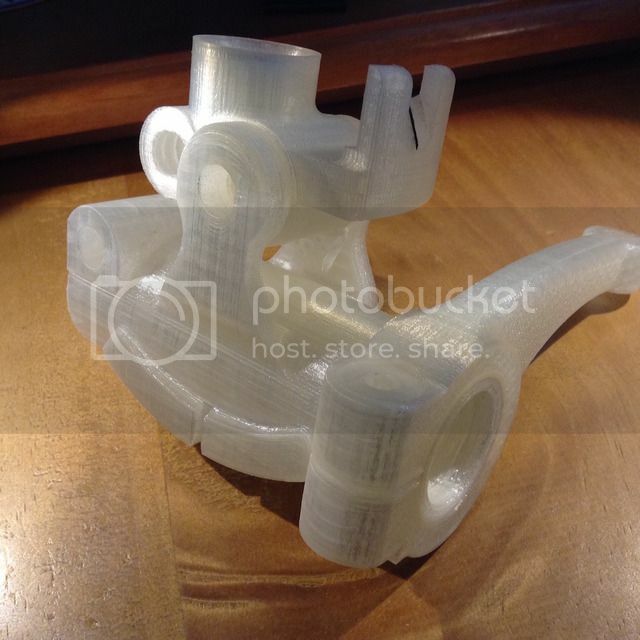 When this picture first loaded up, I thought you might be printing replacement hip joints now.... :P Maybe some day down the road. Put me on the wait list for a few decades (hopefully) from now. If you go with folded bellows, then make the stiffeners from light plastic and use a v-bit to create the pattern similar to making stencils (assuming you have CNC). waterproof nylon bellows, yep that's a possible, cutting die in arbour press and steal a bunch of cagoule's. Is it just me but 3D printing match plates for aluminium casting.. wouldnt that be a not to bad use of those plastic pukers? Do I give you the credit for coining the term? I love it! 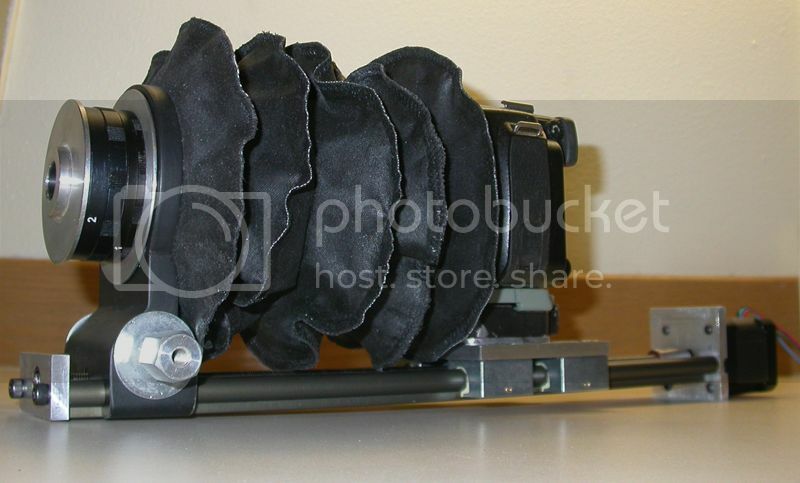 The best looking way to do bellows would be the origami method used by the vintage camera folk. Use polyester paper. It should fold like paper but won't get torn as easily. There are places that will make them for you - I had some made for my Fanuc Tapecut Wire EDM re-build. That you would do yes. I really dislike 3D printers in its current "form".. They can rarely print something that is really useful, even on an industrial scale.. But for casting molds, matchplates and prototypes i think they are in their right element. Next parts coming off the CAD system. It's been FUN, checking the geometry and as far as I can tell I can still move a cutter into the same plane as the offset head, just not as far off centre. Will it affect relief angles ? I really wasn't happy with the idea of going with a single side support, though it is in another drawing revision if I want to try it later. Moving the head inboard also meant having to sculpt out some of the casting to allow the head a full ±30 degree movement. 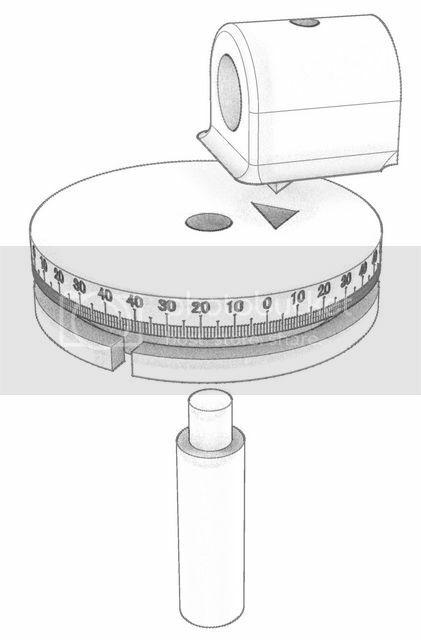 I have increased the rotary table spindle diameter to 15mm, this is one area I am unsure if I will need a metal component to support the table above it. The scale will be printed as a seperate component in black to be treated as the thimble was, then welded in place. Still to sort, the pointer arrangement coming off the table support, nothing pretty yet and may stay that way. I suspect that over time the parallel bars, if plastic, will sag. I hope that I am proved wrong, but that is what my engineering experience predicts. Andrew, I don't fault your logic. I have no doubt this thing will be "Bouncy" how much ? Not sure and if needed I can print supports for under the workhead casting or bars to bring it back up. If you don't try, you won't know, and its a good test of my CAD, design and printing skills. I suspect it will work in a fashion, if nothing else for the reason Norman commented, the cuts taken are "VERY" light, I won't be trying large cutters on it, but will play up to 6mm end mills and 1/4" HSS tool bits. Long term we shall find out what its limitations are, and how much of an impact they have on getting a job done. It's not a SERIOUS tool, for those their heads at this mad man building plastic tools. However, we shall see where the technology takes us, and how it progresses over time, just get those creative juices flowing guy's. This has so far all been designed and printed from the comfort of a nice warm room. Only the bar you see has required any machine work. YES, it really squeaked as I pressed it in on the drill press and it took more force than I expected. The bar has also pulled the two part base print into alignment, which is nice. Progress, but the next bar is going to be more of a problem as I need to make some form of honing tool for all the printed parts that go on the front bar. It's precision Norman. Don't read me wrong Jules. 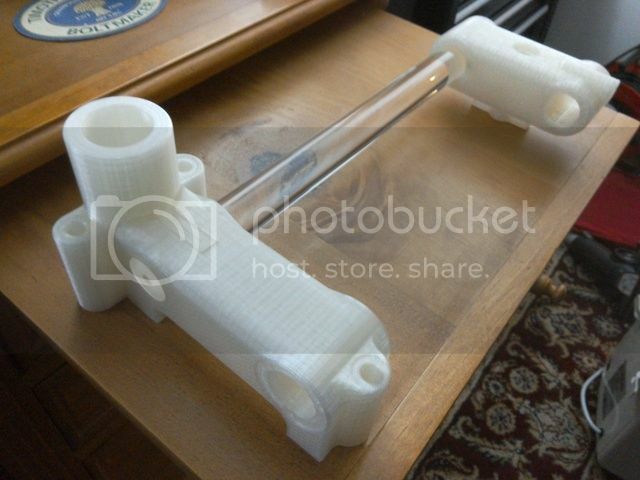 I think that this is a very creditable job, and I am envious of your obvious 3D modeling and printing skills, and it is very good to see something potentially very useful being made this way. So far I've baulked at setting myself up to 3D print as most of the kits and plans seem to produce toy sized stuff to a limited accuracy tediously slowly. I should add too that although I've been throwing in the odd sarcastic comment from time to time that I've been actively watching this with interest. I'm on the side of the fence that says 3D printing is still very much in its infancy.... maybe not even born yet. But I'm rooting for it as it comes into mainstream. I'm wishing you and your project be a success despite my healthy skepticism. Andrew, not a problem. The machine I am using isn't in the same league as the home built jobs, even though it was a cheap printer. It did take some work to get the results I have now and it is slow to print in comparison to a large CNC setup. BUT, slow is not a problem as it just gets on with the job, whilst I do other things. Once you have the parts on file, they can be duplicated in just a few hours or modified and tweaked as needed. It's the speed for prototyping and relative low cost of materials, before committing to more expensive materials/processes. A lot of my work, gets sent out for injection moulding abroad, a 3D print just gives the guy's paying the bill a little more confidence about what they expect to get from my 3D model and their moulding company. Thanks for the compliment on the design work, it means a lot. Norman, I'll do my best, and if that isn't good enough, I'll bodge it till it works. Ahhh, good and bad news today. The bad, my two part base casting has changed shape due to the bed bar being pressed in. The good news, I incorporated a 3 point fixing from the start so I will be able to shim and clamp this down to get things lined up. I should also be able to tweak as things change over time. The vertical bar will be threaded at the base end so it too can be bolted down to help keep it true. So not unduly worried over the changing shape as that early change in fixings looks like it will pay off. Today I completed a couple more parts of the workhead casting set. Still a lot that could be tweaked on parts here. I have NOW decided that all my cotter pins should be 10mm as standard, so have gone back and redrawn the right hand base casting as that still had an 8mm bore, and bulked up the casting outside around the bore. I won't reprint it for this try, as my play time window is starting to close, so more eager to get something working. Can revisit tweaks and mods later. Starting to get interesting now as we get more of the castings completed. Looking through my plastics stock I found some 10mm Delrin bar that looks like it will be cotter pin material. Another job completed whilst the printer was busy, I made up the 30mm vertical Perspex bar and started thinking about how I will do the spiral. Having looked at the lathe, I can gear the cross slide 5:1 to get a 1/2" pitch. Looking online I found a gear generator that allowed me to produce the intended gear train. The front bar is going to wait till I have the base clamped and lined up with the rear and vertical bar in place. I have a plan to ease the bore on the front once things are something like lined up and held in place. This is no metal casting !!! I am watching this with great interest! When it comes to a motor and spindle the originals will be far too heavy for this printed project. May I suggest you look at some of the electric helicopter motors that are available? Their power to weight ratio is awesome. 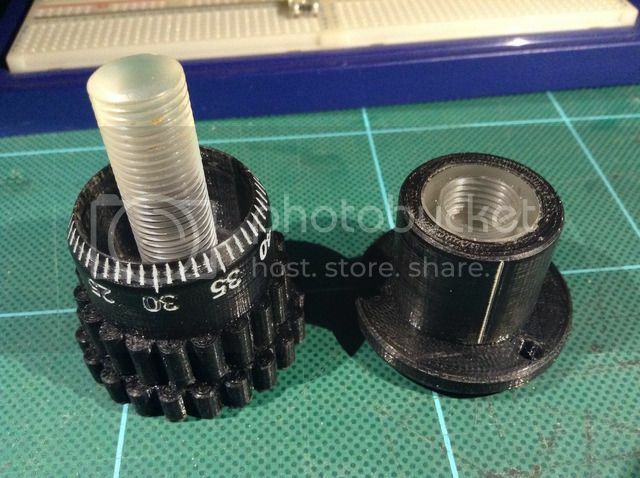 (These are similiar but cheaper to the CNC Stepper spindle stuff that are available). They also come with speed controllers. After all its not really the size of the grinding wheel that matters its the surface RPM. So a small motor at 30,000 rpm can drive a quality mounted stone with enough surface speed to equate to a 75 mm cup wheel! Shucks Will_D, I've been busted.... I was keeping that detail back that the spindle will most likely be a combination of Dremel and Foredom flex drive. NO, I won't be printing the spindle.... In the meantime whats the smallest cup wheel you can get, how hard is it to make grinding tools by reworking existing small stones. Your spot on Norman, I have looked at the Quorns using threaded rod to jack the spindle up and down, rack and pinion not really an option for printing as the part size would be too weak. I fancy making the tool to do the spirals as you never know what the next small printed machine might be ? This isn't going to be the last. After getting bugged about how to cut the spiral on the vertical column. I started doing some more doodling and so far have this idea bubbling. The column will be between centres and the large gear will clamp onto the column. 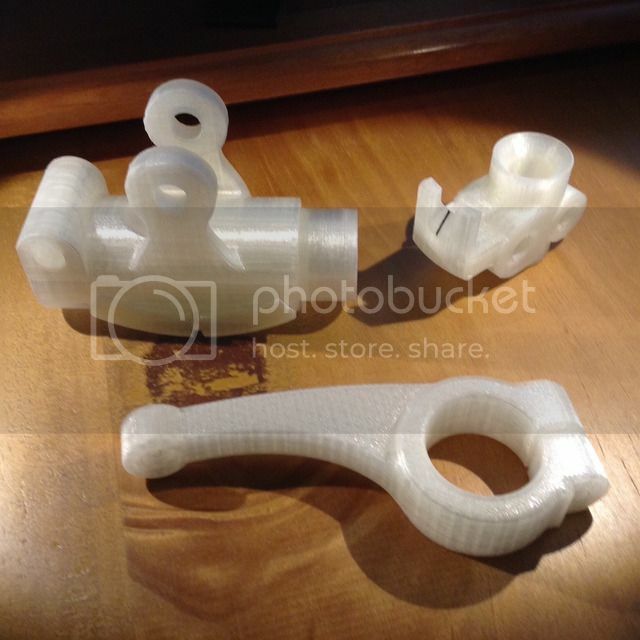 Since I have a good quantity of 30mm bar left over I will print clamps to attach centres and supports for the bar. Loading will be light as I intend to mill a 3mm slot on a 0.500" pitch hence the gear ratio 10:1 on the Taig mills 0.500" x 20tpi leadscrew. 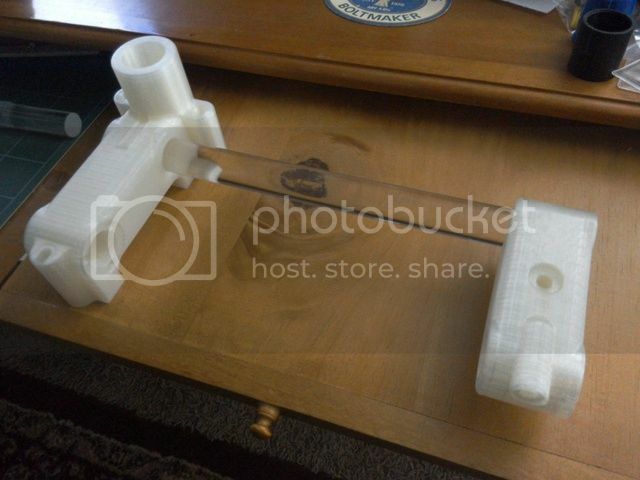 Gears will be printed, but shafts turned and supported in bushes. Still developing this one, so it could all change. I have to give credit for the 3D Taig mill to Richard Crook, very useful model. 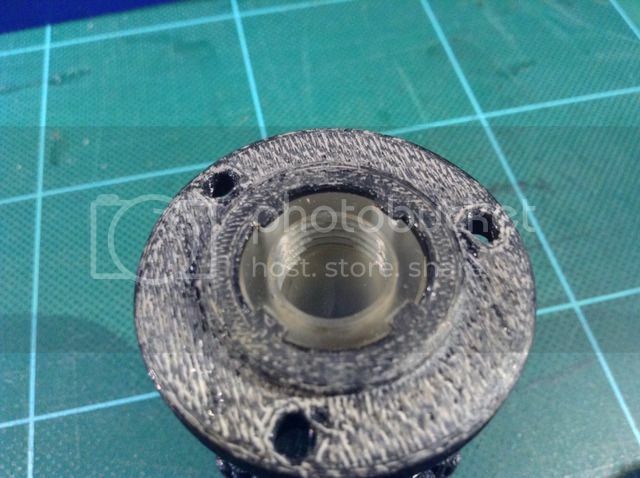 Here's an example of going beyond the limit of a 0.4mm nozzle. I printed both these scales at 0.1mm layers, I had tried looking to see if 0.05mm layer would improve resolution, but in this case I am up against the 0.45 blob resolution. Scale on the left was printed first, due to the size of the graticules and characters printed, even gentle rub down soon showed problems like paint creeping along the grain between layers, and the dark line is a rounding adjustment as the printer goes to the next layer. I increased the font size and picked something with thinner proportions. Not much I could do with the graticules, they could have been added after, making them deeper would have been problematic in printing as the surface would start to ripple. Other than that, the scale is a good fit, so if I don't weld it in I have the option to reprint at a later date in higher resolution. The workhead turntable is really giving me headaches, partly due to the scale around it and also making it as stiff a structure as I can. 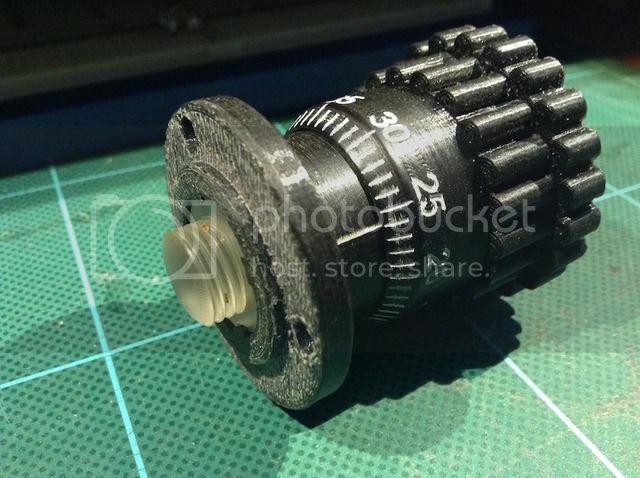 I found a 16mm reamer in my tool draws, with hindsight I should have adjusted the fit of parts to accommodate a 16mm spindle, but as things are now I break through on to the pivot. Maybe remodel after we see how things work out. This afternoon in the workshop saw me completing the micrometer adjuster. However as I finished milling the grooves in the threaded insert I had made, I realised I had got the splines in the wrong orientation. I might be OK as it took some force to press the insert in, so it may stay put as is, but a drawing revision is in order and a spare part printing. This is the underside of the print, so not very pretty. I could have added a little more material and given it a quick skim in the lathe to give a pretty surface but it's not visible. The Perspex threaded parts look like they are going to work, and can take quite a good load being 27mm of thread engaged. Final assemble shot and a bit of furniture wax added to the threads. 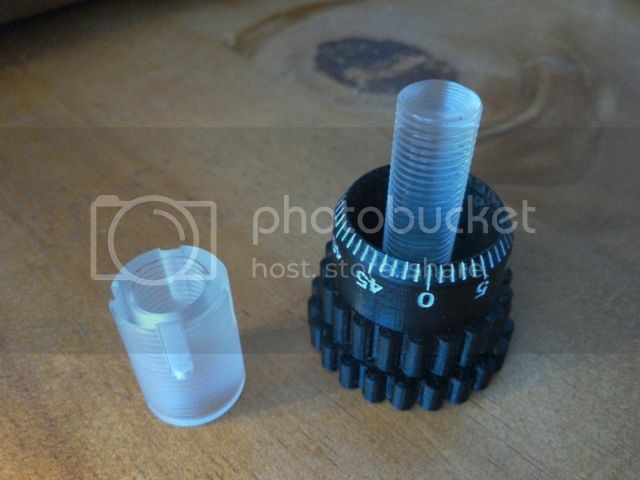 If you want to learn how to screw cut, you can't beat using Perspex. Easy to see the thread forming, tooling can be incredibly basic, even mild steel tools can be used. For the internal threading my threading tool was made from s/steel tig wire. Perspex is unforgiving of tight fits though, so you need to be accurate, but the material is so cheap you can try over and over again till you get it right. 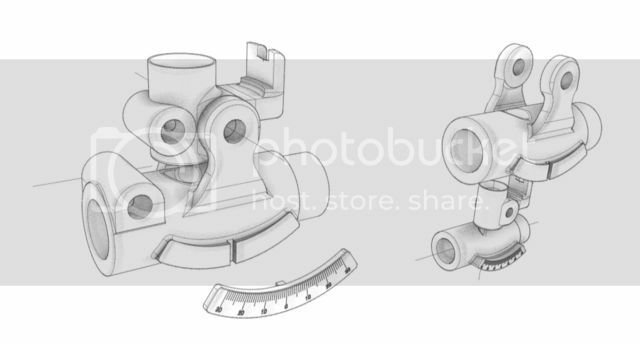 Micrometer body reprinted with splines at correct end this time. Whilst I had it apart waiting for the new body to print a quick picture of the insert, otherwise it all looks the same assembled. I worked out a plan for the rotary table. It will start off with a perspex spindle as that is easy to substitute for metal if needed. The table is split in two parts, again to make best use of printed grain. I chose a triangular plug for welding into the table and lock orientation of the bar support. I have opened up the bar support to make use of my 16mm reamer and bulked this part up a bit as the walls are quite thin as standard. About 10hrs for these parts to print, then ALOT of fine painting. 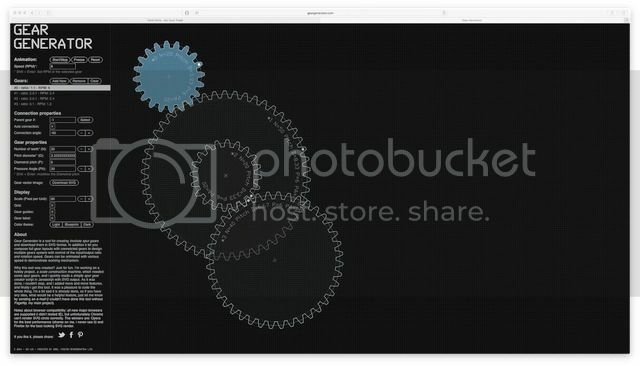 I've been watching this build with great interest even though I have no plans to get into 3D printing. You said you were going to use pinch bolts and split cotters as clamping systems. I would have though that split cotters, although largely superior on castings would be not so good in plastic for the same reasons that you said that metal inserts would not be very good. 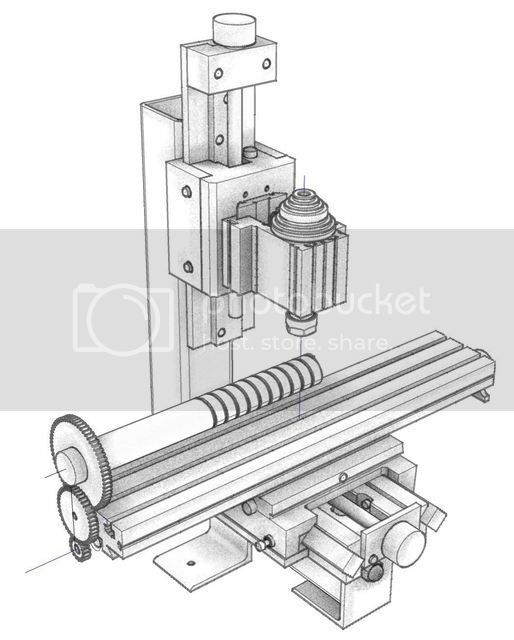 The cotters expand and would probably deform the plastic whereas clamping bolts encircle the stresses around the shaft. Your thoughts? 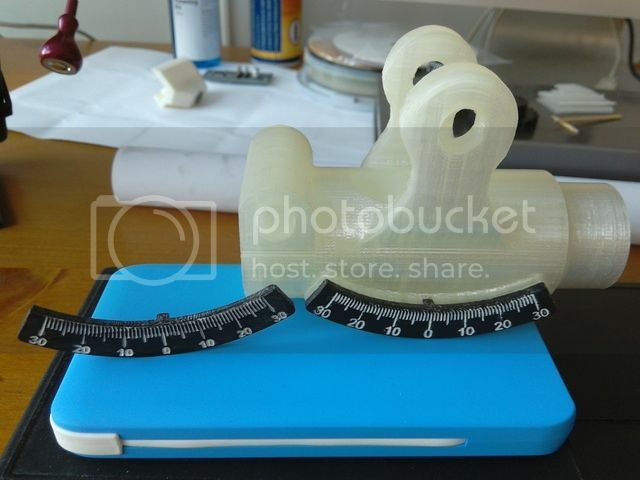 Mattinker, I am hoping the forces needed to clamp the parts are very much reduced being plastic, also that the distortion will be in the area of the cotter if overtightened. This is still all part of the learning process, it's quite feasible the cotter will distort and jam. Split rings concentrate the stress at the pinch bolt, an option would be to build up a ring round the casting for extra support in this area. As said early on, the design keeps changing as I mull over ideas and get input from others. I hope it inspires others to have a go and learn from my success and failures. It's a whole new game, to see if we can make some proper use of the technology in the home workshop.